Rocketship X-M (1950) was the second of the American science fiction feature films of the space adventure genre begun in the post-war era, in 1950. This is because the timing and location of the strike are consistent with the impacter being a part of the annual Taurid meteor shower. While the stuff in meteor showers is generally sand grain size, there's no guarantee it has to be. Uh oh. 29MAR2012 Jason Utas los angeles, california, USA 6:29am PST 1-2 seconds not known, facing NE overcast sky became brighter than midday for 1-2 seconds Sun. not known - view obscured by fog had enough time to look around, see all surroundings illuminated. assume flash was terminal burst - must have been very bright to penetrate fog. We need your sighting reports to confirm this event; please submit a sighting report. Thank you! What was that light in the sky over the Front Range? But most of the mass of dust particles entering the atmosphere are much smaller than this, so can be detected only using specialised meteor radars. "We have a conundrum -- estimates of how much dust comes in vary by a factor of a hundred," said Plane. OPTICKS, a live performance during which digital images are sent by radio to the Moon and back, returns for GAM 2012. OPTICKS will stream live on April 28 from the radio telescope in Dwingeloo, Netherlands where the signals are received. Pictures can be submitted to be Moonbounced as part of this live event. What do bats have in common with the work of radio astronomers? More than you might think. Find out during this live presentation on April 8. The artwork series “Neurostar,” created by the leading Canadian artist Landon Mackenzie, will be showcased in a new video accessible from the GAM website on 21-22 April 2012. The very popular Cosmic Concert returns for the third time in GAM. This new online musical performance for GAM 2012 is again based on music by Giovanni Renzo and features images from the World at Night project. Watch the trailer on the GAM website. A 45-minute video describing how a group of Dutch astronomers created the first-ever map of our Milky Way Galaxy will have a special showing for GAM on April 14-15.Spiral Galaxy: the Milky Way Unraveled features astronomers involved in the creation of this historic map after decades of effort of centuries of mystery about Earth's place in our galaxy. Submit pictures to be part of a mosaic going to the Moon and back in Kids & Teens' MoonBounce Global Collaboration. This special Celebrate Starlight photo mosaic poster will be Moonbounced during GAM 2012, video-taped and showcased at the Astronomical League Conference in July. GAM 2012 is featured on the Sky and Telescope magazine website with an article by AWB President and Sky and Telescope contributing editor Mike Simmons. The article is on the website's home page as this newsletter goes out on March 29. Watch for more articles on GAM 2012 on the Sky and Telescope website. Sky and Telescope is once again the Media Sponsor for GAM. Register Your GAM EventsAdd your events to the GAM 2012 calendar. See when everything is happening all through April. GAM 2012 Trailer - Watch It, Share It! Share your work with others as this popular contest returns for 2012. Based on data from three allsky cameras, this meteor was traveling on a heading of 260° about 30 km south of Grand Junction, CO. Its ground path was at least 86 km, its average speed was 18 km/s, and it was very shallow (~6°), burning from a height of 54 km to a height of 45 km over the recorded path. 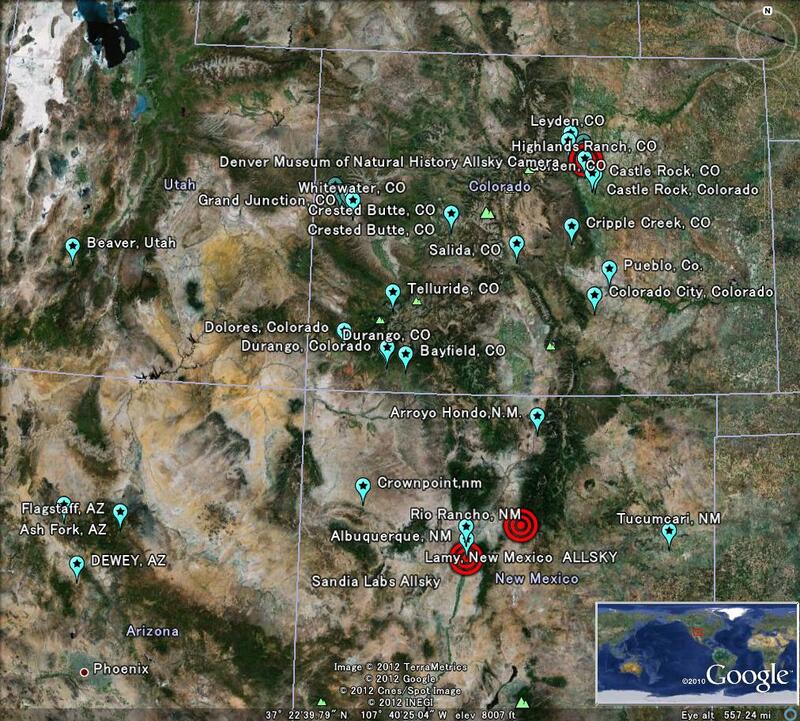 It terminated over the CO-UT border. It was a good candidate for a meteorite producer, but anything that dropped is going to be in hard terrain. 28MAR2012 Kevin ORourke Orroyo Hondo,N.M. 2100 mst 3 seconds Northeast to Southwest from space to ground Green with yellow tail Very Bright not as bright as moon but brighter than Venus No Amazing visual,as I traveled west on the entrance road C.R. B007 headed toward my home from State Highway 522 North I was roughly 1/2 a mile onto the still paved road,when looking at the whereabouts of my home I saw a HUGE (Much larger than any other meteor I had ever seen) Fade out right about the position of where my house is located.I quickly dialed home and my wife answered and told me she was reading a bedtime story to our son.I can not believe how bright it was and how close it appeared.It seemed so much closer than say Arizona.The abrubt blackout above the perception of my home,had me somewhat concerned.I have heard of nothing since its sighting roughly 45 minutes ago. 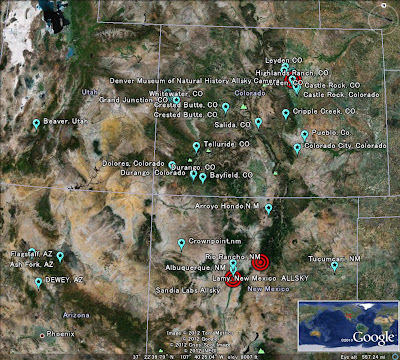 3/28/2012 Nathan Castle Rock, Colorado, USA 2038 / MST 3-4 seconds Object was travelling Northeast to the Southwest. I was facing West Green near the head, yellow and orange through the tail. As bright as the moon was tonight (half moon) None that was observed. Saw a meteor tonight, around 20:38 MST. It was pretty big, compared to a shooting star. Driving west on Founders Parkway from Crowfoot Valley Road in Castle Rock. It moved from the Northeast to the Southwest, green, yellow and orange tail with a circular shape at the head. Size comparison- it was roughly the same size/shape at the head as a streetlight would be from a block away, or the same size as your pinky nail is at arms length. I am also a weather forecaster (USN 9 1/2 years, civilian 7 years). 28MAR2012 Grace Grand junction, CO 8:30pm mountain 4-5 seconds Headed south by south west Blue body and yellow/orange long tail Bright as a firework, I would comparison it to the sun One whole piece that never broke. It was truly unbelievable to see. My brain coundly wrap itself around what it was seeing. Just amazing, was so low and close it seemed as though I could reach out and grab it! A large fireball was captured by two Sonota Corp. cameras on March 28, 2012 at 18:44:41 JST; it was recorded by cameras in Niigata and in Tokyo. Cosmic impacts might have knocked matter off Earth in ways that make our planet quite different from its tiny stony meteorite cousins, suggesting our planet evolved differently than was previously thought, researchers say. Armagh Observatory scientist Aswan Sekhar explains how Jupiter's influence on Halley's Comet can occasionally boost meteor showers visible from Earth. Find out how long you'll need to wait for the next enhanced shower. The satellite's current distance from Earth in the apogee is 201 kilometres, in the perigee - 181 kilometres, inclination - 81 degrees. 27MAR2012 Kristen Trevose, PA US 05:00 - 05:10 am All 4 were between 10-15 seconds South East, Falling down Looked like a faint light falling slowly leaving a trail. There was 4, one at a time, and all 4 had the same exact smoky trail Like a dim star, reddish orange, going in and out of view/brightness as it fell No The smoke trails were almost like a wide upside down check mark, thickening as it faded after about 5 minutes. I tried to take a picture, but it wouldn't show in my camera. 27March2012 Kris North East, MD, USA 00500 Eastern US time 15 SE/S white with expanding tail Very Bright: Luminus no Multiple items in the sky at the same time. Each one making its own distinct tail/trail. early morning sun may have given tails their brightness. Never seem anything like this before. I thought it was commet at first. 27March2012 Kim Forked River, NJ, USA 5:05am EST About 10 seocnds/ meteor. There were about 4. East White tail The reminents/ tail was a bright glowing white color It broke apart leaving a trail behind it. The glow from the trail lasted about 30 minutes before it dispersed throught the sky. It looked like a plane when it has the smoke behind it. MOSCOW, March 26 (RIA Novosti) - Meteor-1, the Soviet Union's first fully operational weather satellite, will on Monday night re-enter the Earth's atmosphere after more than four decades in orbit, the web site of the US Strategic Command said. NASA - Lyrids Meteor Shower: 'Up All Night' With NASA! The difference between meteorites, and meteoroids, and where they come from. Meteorite Times March Issue Up & Celebrating 10 Years! The March issue of Meteorite Times is now up and marks 10 years of producing Meteorite Times, having started with the first issue in April 2002. It's hard to believe that 10 years (120 monthly issues) have gone by so quickly. A special thank you to all our contributors who've stuck with us for so long. The following URL gives access to the Web Browser View, Flash Magazine View, and Mobile PDF. 25MAR2012 Alexis Appleton, Wisconsin (kaukauna) between 10 & 11pm central time zone, USA 10 seconds It was inbetween south/southwest. Bright like fire. Huge flame, long tail. Shades of orange and white as well Bright like the sun. Like you has a lighter in your face. Bright, warm colors. Started off looking like a ball with fire. But as it approached the ground, the ball-like object seems to be burning up smaller. long tail, made a noise when it hit. Fell straight up & down from the sky. Incredibly up high in the air. 25MAR2012 Michele Oak Forest, IL USA 11:01pm CST 10 sec N-NE White, Pink, Yellow, Blue Like a falling firework. Amazing. Line of light, ball, line of light, smaller ball, fade out Very cloudy cool night. RARE Meteorite Strikes Roof in Oslo, Norway!